Miniature sized cupcakes are a whole lot of cute. 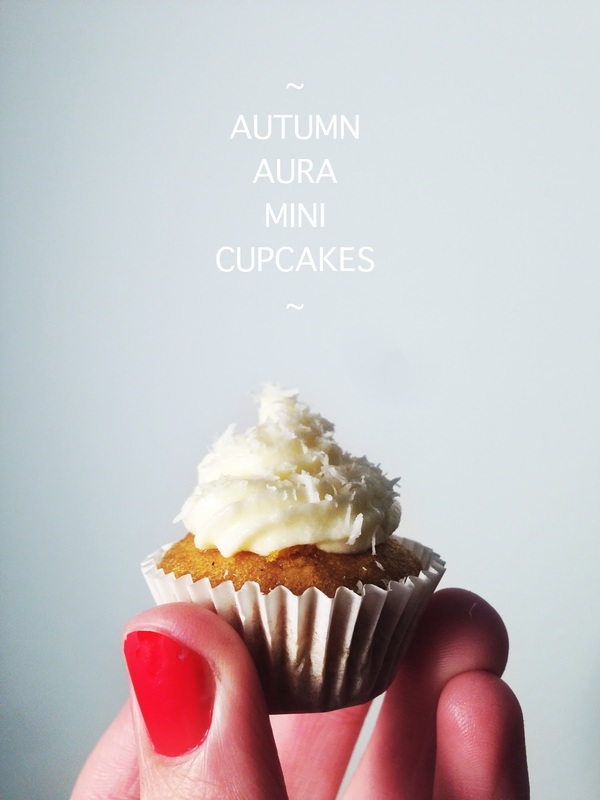 I called these mini stunners 'autumn aura' because if autumn were a pallet of flavours, that of this cupcakes would be there, side by side with roasted chestnuts and pear compote. Behold the beauty of these tiny things, the dash of coconut on top lending them a snowish appeal. 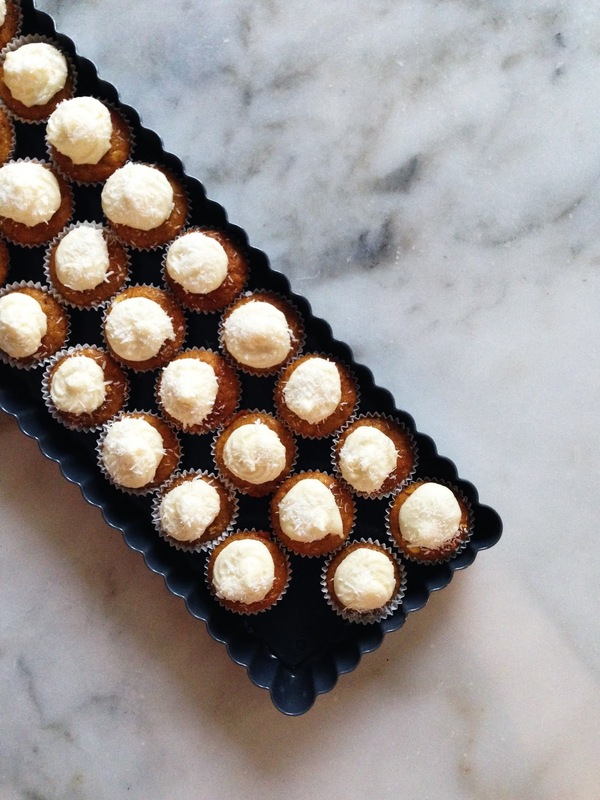 Bite into the delicious balance between a moist peppery pumpkin cake and a thick vanilla cream cheese frosting. And you wanna know what...? They are also gluten-free. Oh what a sweet sensation it is to whip up cute tiny things! These cupcakes are an absolute delight to the sight, from the moment you pour the batter into their cute miniature shells, through all the decoration process, to the instant you finally rest your smiling eyes on the whole set after frosting them one by one. We have this saying in Portugal, something that goes like 'the eyes also eat.' They do, and these cupcakes are a delicacy. As it could not be otherwise, they are a delight to the palate as well. I was amazed at how well they came out, since it was my first time going totally gluten-free from scratch. No recipes, no tips, no cheats, just my satisfactorily sharp gut instinct. And once more this month, I'm quite impressed with my own instincts. 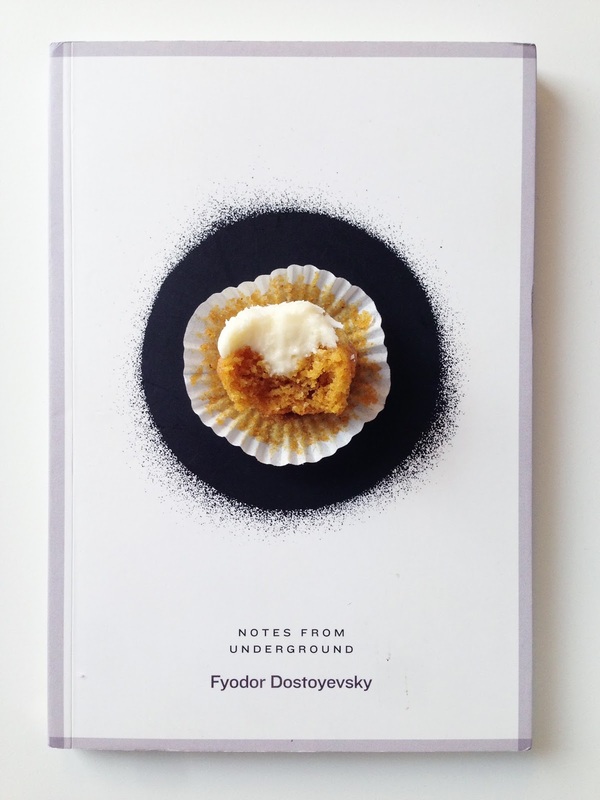 Not only was the consistency of the cake itself perfect, with an even and moist crumb that raised exactly like a cupcake should... the flavour was also delicious. And the best part? You can probably find all the ingredients at most supermarkets, since I didn't have any rare sort of flour or xanthan gum at hand. Maybe this is just an architect talking... but isn't there something special about miniatures? I cannot be the best judge for this, because I make a living out of scaled-down stuff, but what do you think? And what exactly is it that makes them so special? I have given this subject quite bit of a thought on this other post earlier this month, so if you would like to know what I think about mini-cupcakes, just follow that link! I leave this for debate: does everything simply look cuter in its miniature version? de abóbora, cenoura e especiarias com cobertura de queijo creme, baunilha e côco. Cozer a cenoura com a abóbora em água temperada com sal. Escorrer bem e reduzir tudo a puré. Reservar. Peneirar todos os ingredientes secos para uma taça grande, misturar bem. Bater os ovos separadamente. Misturar o óleo e a baunilha no puré de abóbora. Utilizando um fouet ou uma espátula, incorporar o puré nos ingredientes secos, seguido pelos ovos, batendo tudo muito bem. Pré-aquecer o forno a 180ºC. Forrar dois tabuleiros para mini-cupcakes com formas de papel de tamanho adequado. Com a ajuda de duas colheres de chá, distribuir a massa pelas forminhas. Levar ao forno cerca de 10 minutos, na mesma prateleira ou um tabuleiro de cada vez. Retirar do tabuleiro e deixar arrefecer. Bater a manteiga com o queijo creme durante cerca de 3-5 minutos na velocidade máxima, ou até estar bem cremoso. Juntar a baunilha, o limão e a gelatina e bater novamente. Gradualmente, adicionar o açúcar em pó, até obter a consistência e o sabor desejados. Levar ao frigorífico durante cerca de 45 minutos, ou até estar muito espesso mas não completamente firme. Com a ajuda de uma faca, fazer uma pequena cavidade no centro de cada mini-cupcake. Preparar uma taça com um pouco de côco ralado. Encher um saco de pasteleiro com um bico fino em forma de estrela com o frosting. Rechear e decorar cada bolo com movimentos circulares rápidos. Polvilhar com côco ralado. Levar ao frigorífico pelo menos duas horas para que o frosting fique completamente firme. a peppery pumpkin carrot cake frosted with vanilla cream cheese and a dash of coconut. Place the carrot and pumpkin in boiling water with a dash of salt, let boil until tender. Drain and blend down to a puree. Set aside. Sift all dry ingredients into a big bowl and give it all a good stir. In a separate bowl, cream the eggs. 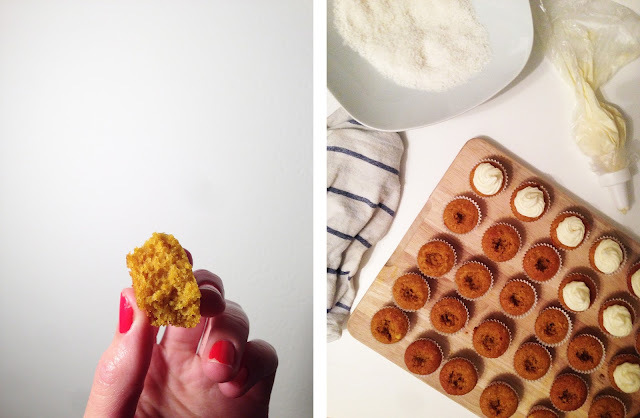 Incorporate both the oil and the vanilla into the pumpkin puree. Using a wire whisk or a spatula, incorporate the puree into the dry ingredients, followed by the eggs, mixing everything very well. The mixture won't be too thick. Pre-heat the oven at 180ºC. Line two mini-cupcake baking trays with appropriate paper liners. 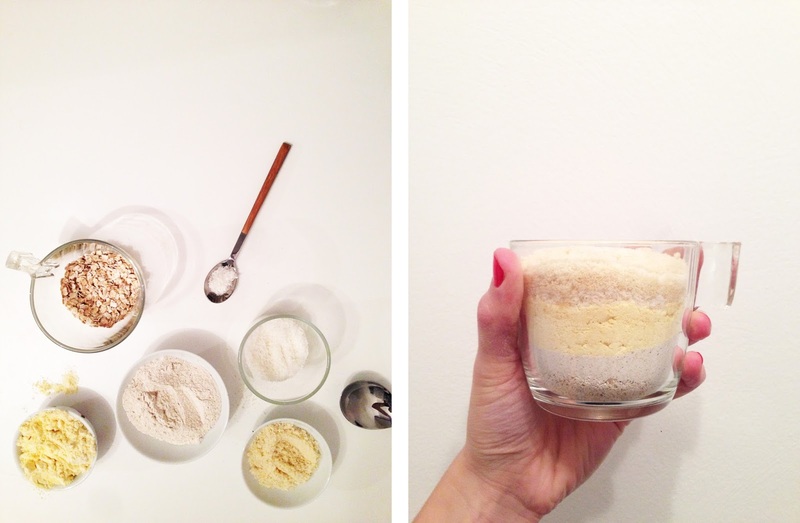 Using two teaspoons, pour a small scoop of batter into each liner. Bake for about 10 minutes, both trays in the same shelf or one at a time. Remove from the tray and let cool completely. Cream butter and cream cheese for about 3-5 minutes at maximum speed, or until very creamy. Add the vanilla, lemon and gelatin and beat again. Gradually beat in the sugar, until reaching the desired consistency and flavour. Place in the refrigerator for about 45 minutes, or until thick but not too stiff. Using a knife, make a small hole in the center of each cake. Keep a small bowl with the coconut nearby. Fill a piping bag with a narrow star-shaped tip with the frosting. 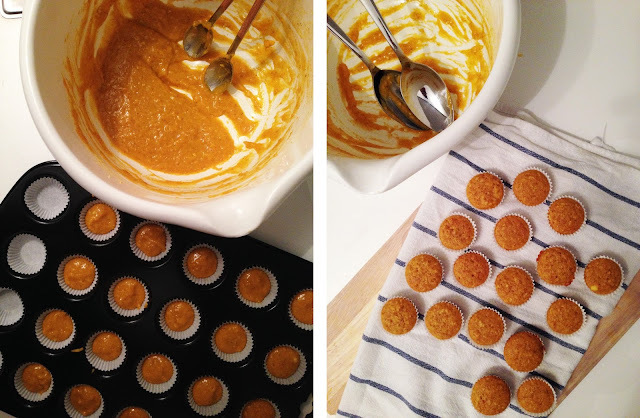 Fill and frost each cupcake in a quick circular motion. Sprinkle some coconut on top. Place in the fridge for about two hours so that the frosting can fully settle. 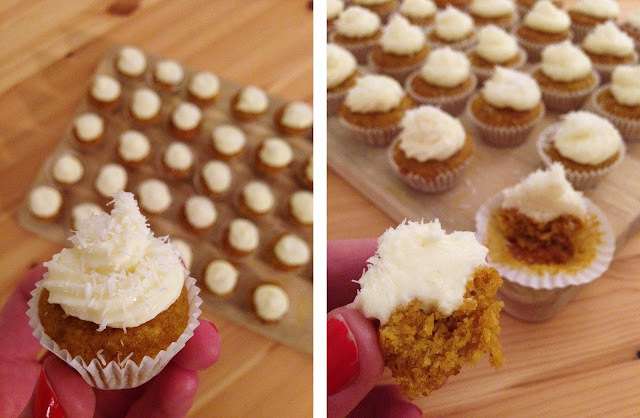 Beautiful little fall cupcakes with loads of flavor and a delightful frosting (loving that touch of coconut to top things off nicely), dear Inês! Liebe Grüße nach München - in Bonn ist das Wetter zur Zeit richtig warm, gar nicht so wirklich herbstlich. Tão lindos em versão mini e com estes sabores de outono...adoro!!!! O nome também é muito giro! Aposto que é impossível comer só um! Que aspecto tão bom! Talvez experimente.